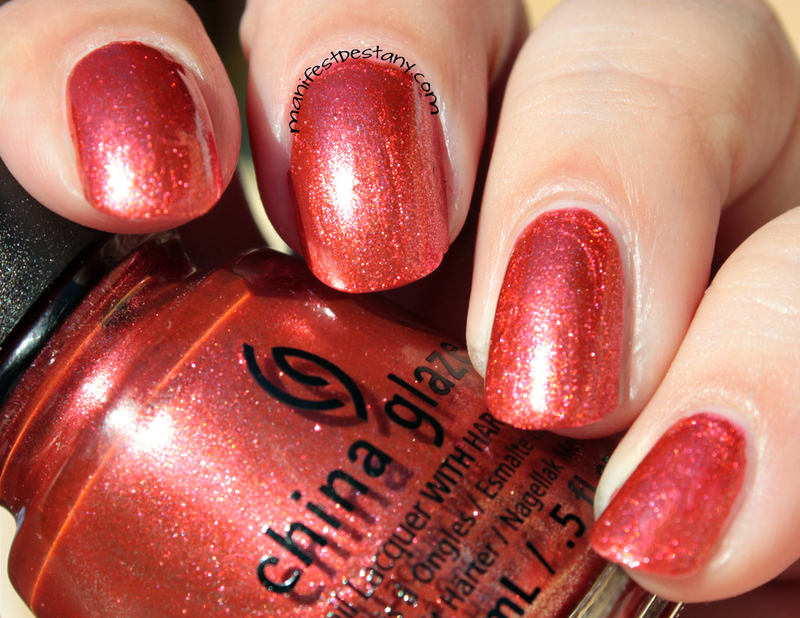 Six of the China Glaze Happy HoliGlaze collection! Yep - I got the infamous There's Snow One Like You! Check out my thoughts, and more swatches, on all six polishes after the cut! What's up first? How about the purple-y goodness of Put A Bow On It! I know the description says "magenta glitter" but I think it's straight up purple sparkle. Gorgeous purple sparkle. I believe, of the six I am featuring today, it's my favorite. Normally, with densely packed, fine glitters, you get a goopy mess or glitter Herpes. This polish gave me neither! It flowed almost effortlessly on the nail, and didn't smooge around or slip like some have for me in the past. Pictured is two medium coats. I was under the impression that Elfin' Around would be my favorite of this post, but it's just not. It's got the same finish as Just Be-Claws, but it's rustier and is more orange. Orange you say? Why yes, that should be my favorite! But it just wasn't. The thinner formula on this one didn't do it any favors, and I had some issues of, well, it's almost like the polish had a mind of it's own and slipped around randomly on my nails. I ended up holding my hand down flat on a table to let it dry without...movement. This is three thin coats - because it kept slipping. And now we're up to There's Snow One Like You. It's... I just don't like it. It creeps me out. It looks like I've dunked my nails in a vat of cottage cheese. It only took two coats to achieve what is pictured, but dang. I can't get over how it looks. I asked my son what my nails looked like, and he said "Well, like snow. But also like cottage cheese, actually." This polish may have seemed like a good idea on paper, but on the nail it didn't translate. Which brings me to the last polish - Be Merry Be Bright! 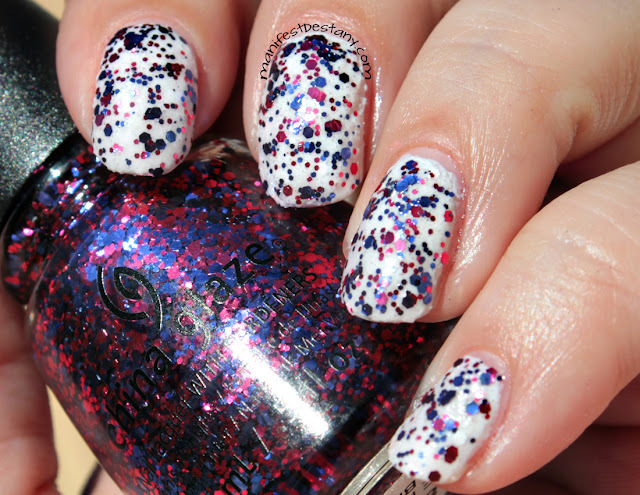 Love this magenta and purple glitter! I decided to try an experiment - Would a glitter topper take away the cottage cheesiness from There's Snow One Like You? The short answer: YES! The long answer: Yes, for about an hour, but then the hungry, hungry Snow One ATE the glitter base haha! I think this glitter looks great over white :) It wasn't too thick to apply, really. What's pictured is two thin coats. Do you have a favorite? My favorite of the collection is most definitely Put A Bow On It. 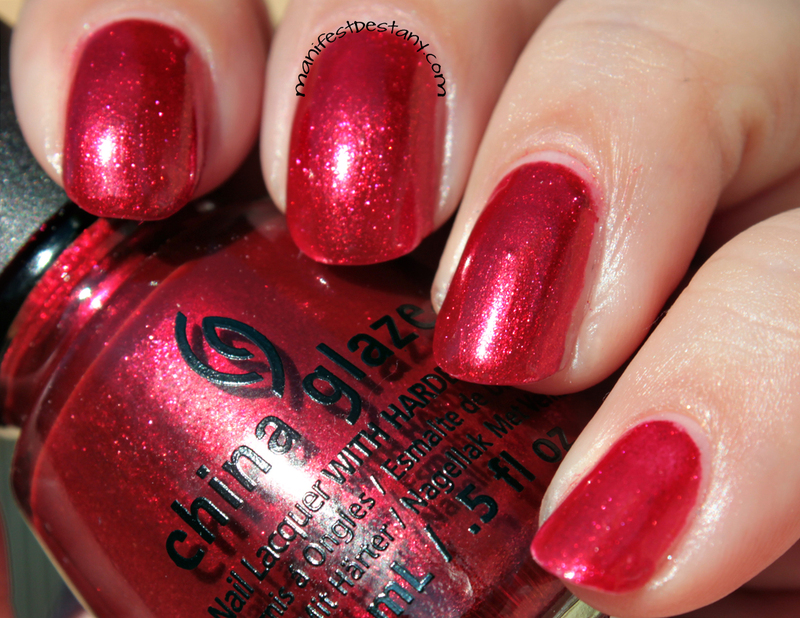 There's just something about that glitter :) Just Be-Claws is a great red, too.. I wouldn't in good conscience recommend There's Snow One Like You - UNLESS you really want to try it out. I mean, honestly, I didn't form my full opinion of it until I tried it. 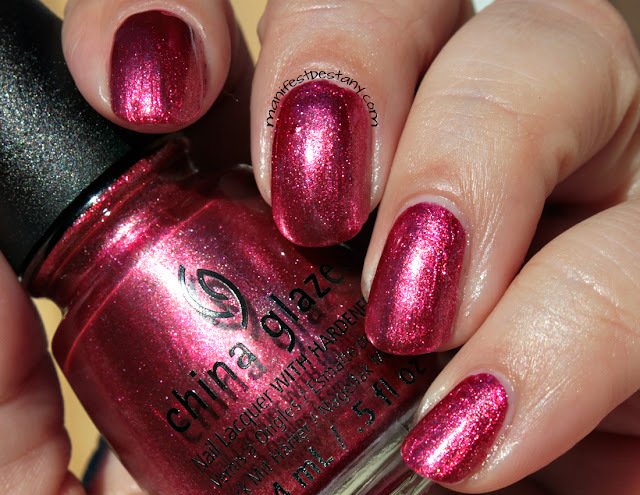 You can find these wherever China Glaze polishes are sold. Price varies by vendor.